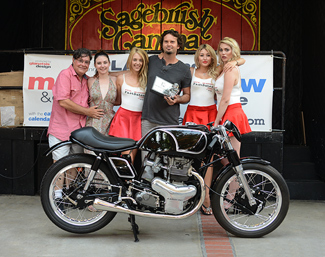 2016 LA Calendar Motorcycle Best of Show winner Yuichi Yoshizkwaat center, in the photo studio with Show producer and photographer Jim Gianatsis, Calendar Kittens Kaustin Rose, Alissa Bourne, Daria Dali. performance brake pads and rotors for both sport and crusier motorcycles. 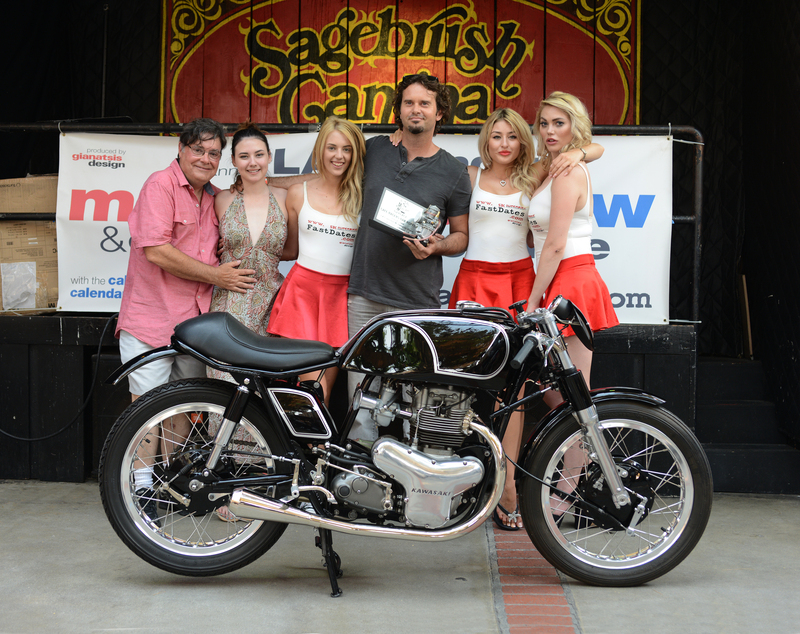 2016 LA Calendar Motorcycle Best of Show winner Yuichi Yoshizkwaat center, joined from left: Show performers Alex Nester and Jaq Mackenzie, Calendar Kittens Kaustin Rose, Show producer and photographer Jim Gianatsis, Kittens Daria Dali and Alissa Bourne. Taking Best of Show this year, as in the last 4 out of 5 years, was another new-to-America custom bike builder out of Japan. Yuichi Yoshizkwa / Custom Works Zon / cw-zon.com, flew his bike in from Japan to take Best of Show at the 2016 LA Calendar Motorcycle Show. This was the 4th out of 5 years that virtually unknown Japanese Builders have claimed the top spot at America's premier custom motorcycle show with their very unique and ornate hand crafted builds. Yuichiti's Cafe Racer themed retro Big Twin bike featured engraved hand formed brass bodywork, a unique front single sided and rear single sided swingarm suspension bolted to a one-off aluminum girder frame, and its American V-Twin replica Shovel Head motor fed by a exhaust powered turbocharger! 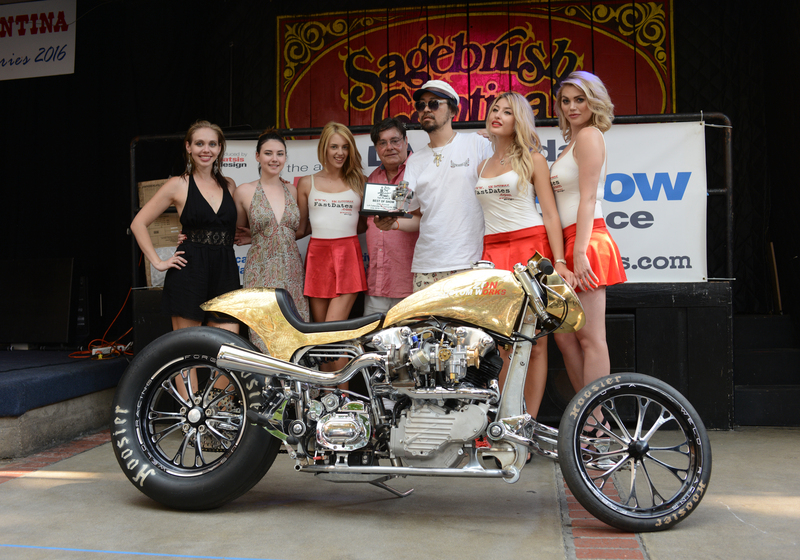 Yuichi Yoshizawa returned to the winners circle in the Street Custom Class with a dragster styled Harley-Davidson Flat Tracker 750cc that he had built with Custom Works partner Yoshikazu Ueda. A few months earlier the pair had garnered the the win with this bike in the Harley-Davidson of Japan sponsored “Street Build Off” where five of Japan’s top custom workshops were given free reign to tear into Harley’s new Street 750, with results that were incredible. 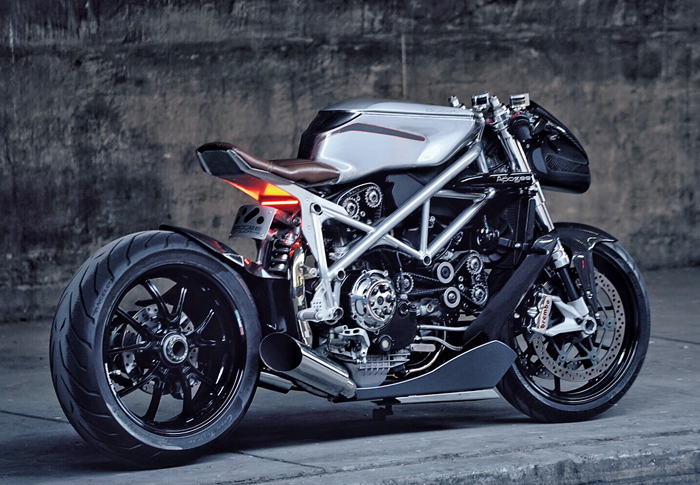 It was jaw dropping to see that Harley’s new water-cooled budget minded street cruiser could also be the base for this incredible custom featuring a single-cradle frame and completely new suspension front and back. The vibe is functional, with an eye on the drag strip: There’s a 19-inch W&W wheel up front, and a 15-inch Rocket Racing rear rim. 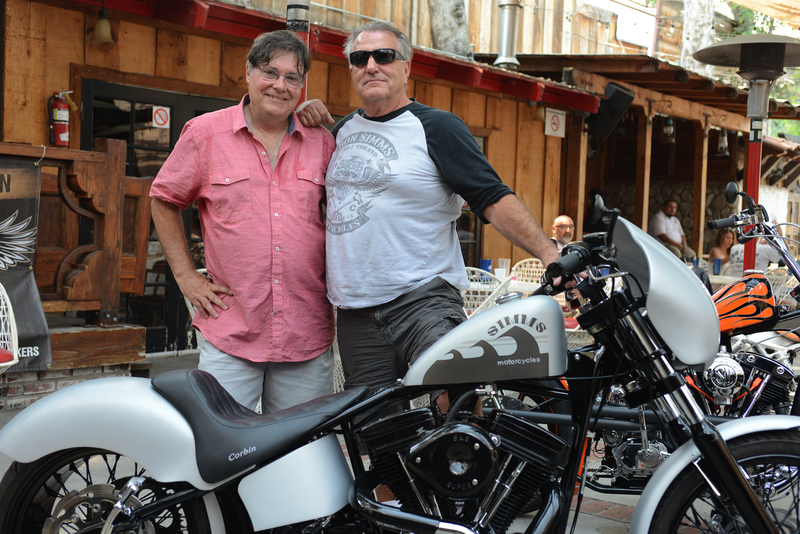 Joining Yoshizkwa on his trip to America and in the winner’s circle at the Calendar Show was his good friend Hiroko Takai / also of Custom Works, followed by a road trip to Sturgis to show off their Show winning bikes. Bar Hopper: 1. Michael LaFountain / RacciaMotorcycles.com, 1967 Kawasaki 650cc W1 Cafe Racer; 2. Kris Van Damme, Triumph Thruxton; 3. Kevin Stanley, Triumph Thruxton. Sportbike: 1. 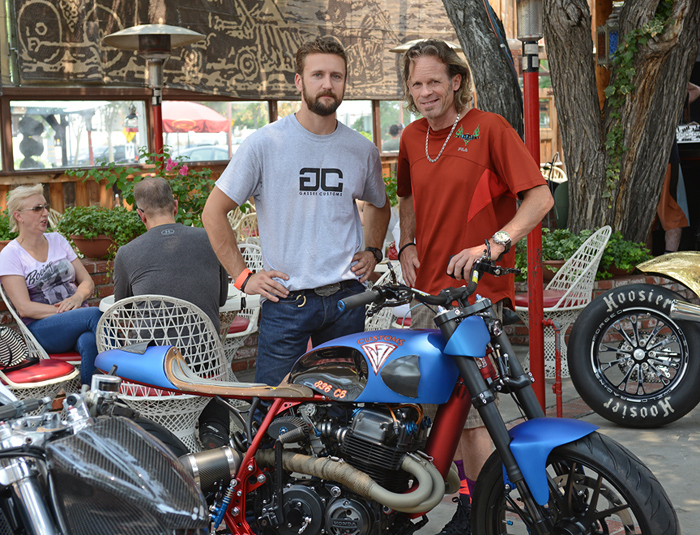 Adam Gasperic / Gasser Customs, Honda CB700 Cafe Racer; 2. Robert Loomis, Norton framed H-D 1200 Sportster Cafe Racer; 3. Alan Breise, BMW HP4 Superbike. Classic American: 1. 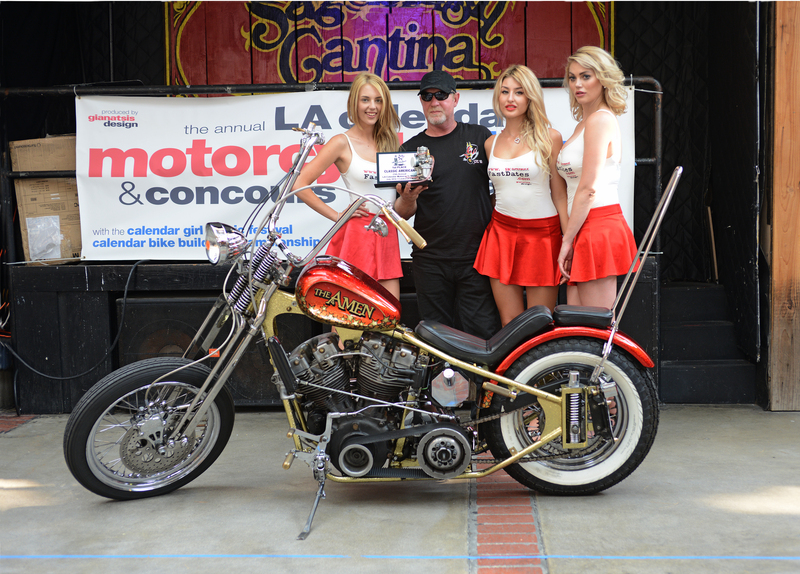 Joe Chavez, Beer Can Willy 1957 Panhead / 1966 Shovelhead custom. 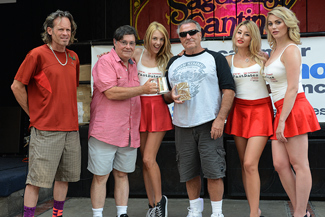 The 2016 AFT Customs Visionary Award presented by AFT's Jim Giuffra to Nick O'Kane and his Honda CB1100. Beautiful17-year old singer songwriter Jaq Mackenzie was featured on American Idol 2015. 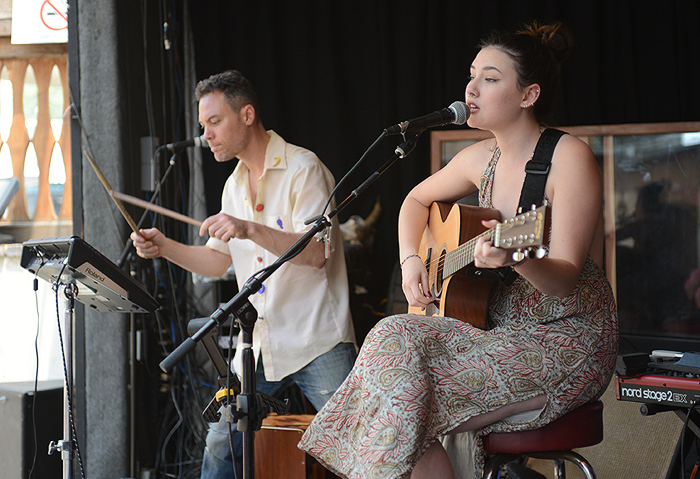 An incredible day of live Calendar Girl Music featured American Idol contender Alex Nester and her band performing two exciting sets of rock classics and her own original songs. Alex also serves as vocalist and keyboardist in the bands of legendary guitarist Carlos Santana and his son Salvador Santana. 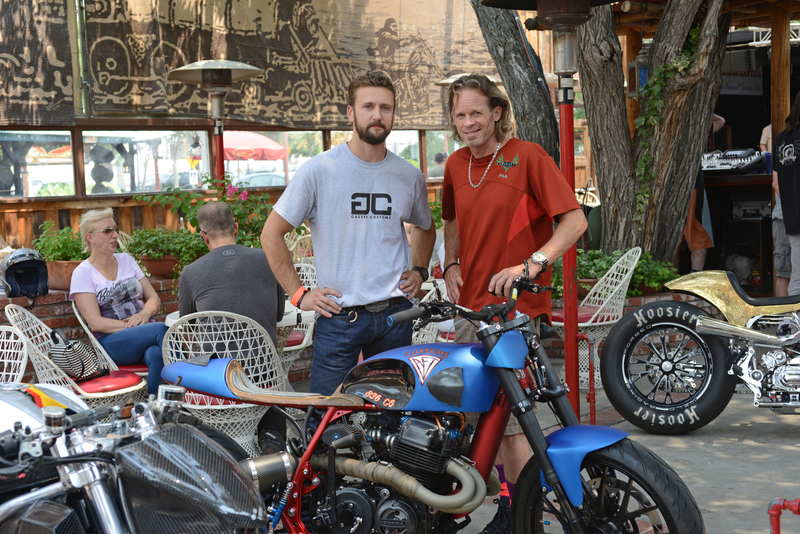 Also performing was incredibly talented 16-year old singer songwriter Jac Mackenzie, also featured on American Idol lat seasom..
Adrian Packett of Canyon Motorcycles / TT Wheels / Black Bike offers wide custom spoke wheeel sets for sportbikes and cafe racers. 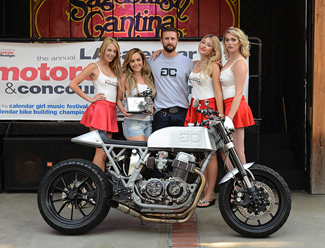 Show and FastDates.com Calendar producer Jim Gianatsis, here with the Best of Show winning bike, premiered the new 2017 Fast Dates Superbike, Iron & Lace Custom Motorcycles and Garage Girls Calendars with the help of beautiful Calendar Kittesn Kaustin Rose, Alissa Bourne and Daria Dali. Ron Simms (seated at right) proudly shows off two of his custom bikes featured in the new 2107 Iron & Lace Calendar. Morgan automobiles at the Calendar Show with their production 3-Wheelr classic which is built in England and features an American made S&S V-twin engine mounted up front . Calendar Kittens Kaustin and Daria arr anxious to take the cool Morgan 3-Wheeler for a drive! Adam Gasparic/ Gasser Customs and Jim Giuffra / AFT Customsare two of America's top mestric custom bike builders who are featured inthe FastDaes.com Motorccyle PinUp Calendars. 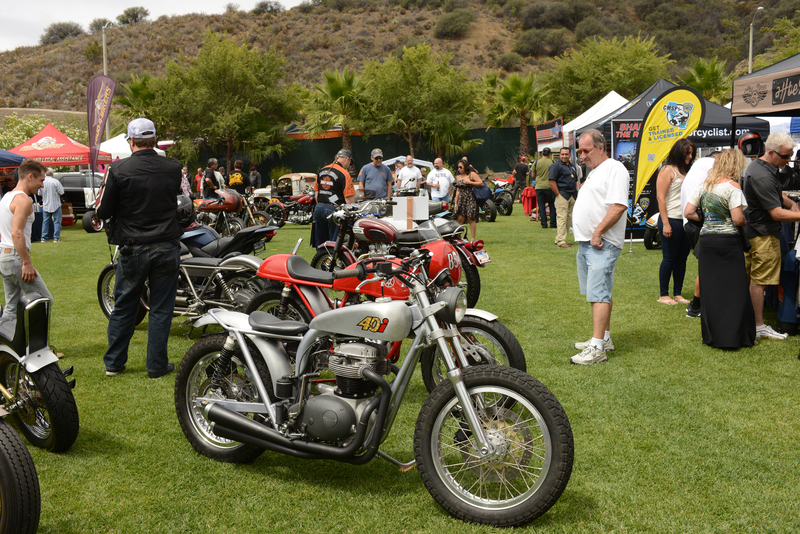 Manufacturers at the Show included Galfer Brakes and Canyon Customs / TT Wheels. Cafe Racer extrastrodinaire! One of Gustavo Penna / Apogee MotorWorks' winnging Ducati Cafe racer customs at last year's 2015 LA Calendar Motorcycle Show is featured in the new 2017 FastDates.com Calendars. 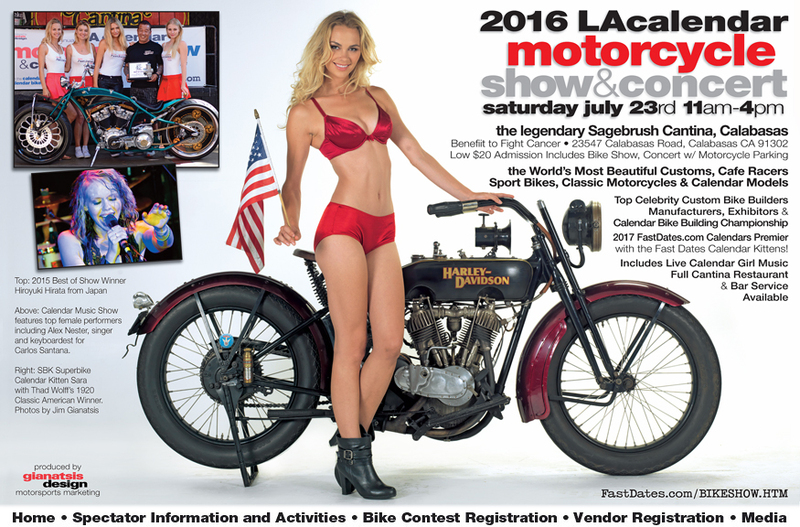 The Show features off the premier of next year's new 2017 FastDates.com Motorcycle PinUp Calendars featuring the world's top road race and custom motorcycles with the Bikes. Builders and beautiful Calendar Kittens featured in the Calendars in attendance at the Show. Click above to find out more and to order.